Mesh Lip: violetta. -female horror mesh lips (RARE02 @UBUME x ORIGAMI NEW! Hair: *barberyumyum*62B(FAT) @SaNaRae (July 25th) NEW! Outfit: `M.BIRDIE × RONOMONO / School Look s/s @Okinawa Festival NEW! + Uniform: `M.BIRDIE / School Look s/s F.typeC2 S RARE NEW! + Scarf: `M.BIRDIE / School look s/s F.ScarfB 2 NEW! + Watch: `M.BIRDIE / School Look s/s F.watch7 NEW! + Stacked Papers: `M.BIRDIE / School look s/s F.Flying in the wind NEW! 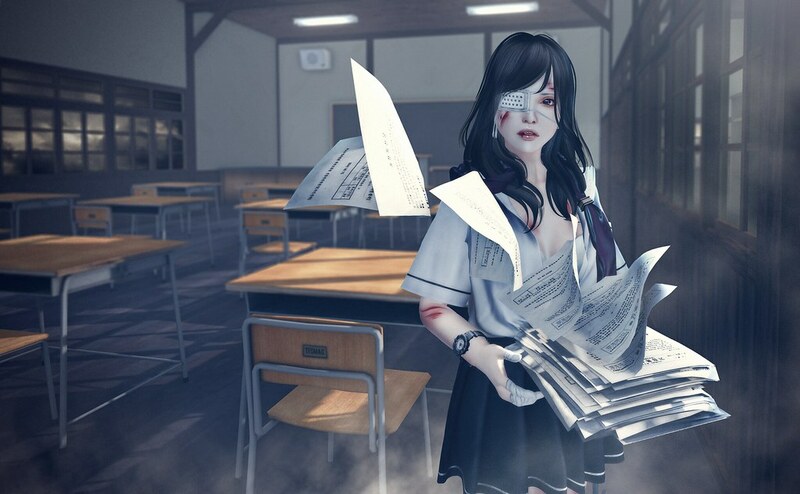 Classroom Set: *TecMac* [School Kit] FAT pack @UBUME x ORIGAMI NEW! + Desk: *TecMac* [School Kit] Student Desk (Anime) NEW! + Chair: *TecMac* [School Kit] Student Chair (Anime) NEW! + Teacher Desk: *TecMac* [School Kit] Teacher Desk NEW! + Science Desk: *TecMac* [School Kit] Science Desk NEW! + Blackboard: *TecMac* [School Kit] Blackboard NEW! + Speaker: *TecMac* [School Kit] Speaker NEW!